Epanvilliers belonged to an old and illustrous french family: the Montalembert and now belongs to an equally old Swiss family which can trace its roots to well over 650 years: the counts of Rordorf. The castle was built in its present form around 1700 by the Tryon-Montalembert and is an excellent example of an elegant yet rural castle of the epoch of the sun king Louis fourteenth of France. A monumental stone staircase in the center of the building is equipped with a beautiful wrought iron ramp. Many original elements of the 18th century such as marble chimneys or wood paneling decorate the castle. The building is divided into a stately lower level, arranged according to the protocol of the dukes of burgundy (en enfillade). 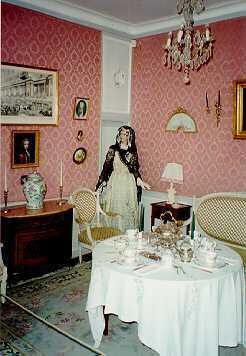 The upper level has been modified in the second half of the 18th century in order to accommodate guests for prolonged stays. Next to a number of stately rooms on this level you will discover small rooms for the children or servants. You will be able to visit over 20 rooms furnished with good taste.